From first-time homeowners saddled with mortgages to the elderly struggling on a fixed income, the reality of insurmountable debt is uncomfortably close for many Americans. The legal, financial, and personal consequences of filing for bankruptcy are often as daunting as sky-high debt totals themselves, but regular people across the country are driven to the process every day. Bankruptcy is a fiscal malady of pandemic proportions, but its footprint is more pronounced in some regions than in others. Where does it strike most often? Which communities experience bankruptcy at rates far higher than the national average? Does bankruptcy occur most often in wealthy communities, where irresponsible individuals live beyond their means? Or is it most prevalent in less glamorous places, where debt exacerbates poverty? In this project, we were determined to find out. Using data from the U.S. Federal Courts system, we uncovered the number of bankruptcy filings in each county in America. We then indexed those stats against population data to determine the per capita rate of bankruptcy in every American county and state. In order to utilize the most recent information possible, we used data on the number of bankruptcies in each American county from March 31, 2014 to March 31, 2015. Those data were sourced from a database of bankruptcy filings offered by the U.S. Federal Courts (uscourts.gov). We included all bankruptcies, both by businesses and individuals, including Chapter 7, 11, and 13 filings. We then divided those totals by the number of people living in each county as calculated by the U.S. Census Bureau’s 2013 population estimates (quickfacts.census.gov). Next, we divided the number of bankruptcies in each county by the number of people in each county to create a per capita calculation. 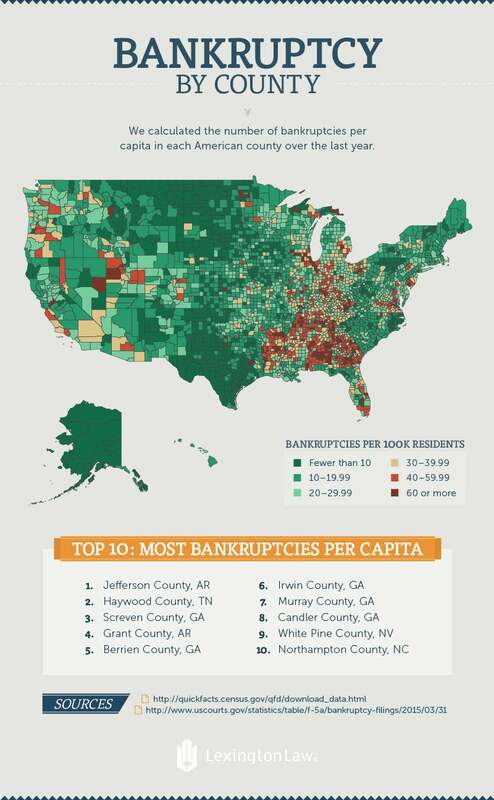 This allowed us a fairer estimation of the prevalence of bankruptcy than the raw totals would have: 200 bankruptcies in a county of 20,000 people is vastly more concerning than 200 bankruptcies in a county of 200,000. We opted for a per-10,000-residents metric in order to work with larger numbers instead of minute fractions, but the relative prevalence of bankruptcy among counties is obviously unaffected. The prevalence of bankrupt counties in the Deep South is pronounced: All but two of the top 10 counties are located in Arkansas, Tennessee, or Georgia, while the cluster of dark red is also concentrated throughout Mississippi, Louisiana, and Kentucky. In the communities most devastated by bankruptcy, entrenched poverty is the rule, not the exception. All but two (Grant County, AR and White Pine County, NV) of these top 10 counties had 2013 poverty rates higher than their state poverty rates, according to the U.S. Census Bureau; the biggest discrepancy was in Screven County, GA, where 27 percent were living below the poverty level, versus the 18.2 percent poverty rate in the state of Georgia. The county with the most bankruptcies, Jefferson County, is home to Pine Bluff, AR, which Forbes has identified as the most impoverished city in the South and the fourth-most nationwide. 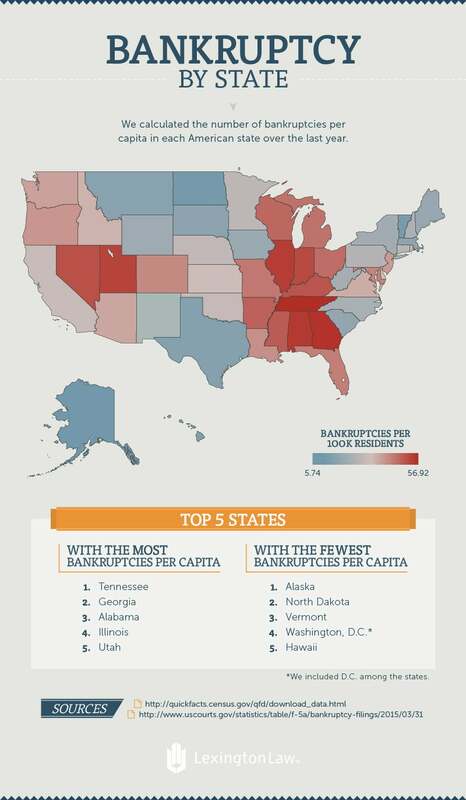 Bankruptcy by State: Expanding the scope of each region we considered, we determined the per capita rate of bankruptcy in every state. Again, the regional disparity was striking – the Southeast is deeply affected relative to the Northeast and Mid-Atlantic. The Midwest, gutted of manufacturing industries in recent decades, has a similar pattern of troublingly common insolvency, with Illinois ranking third among all states. Utah and Nevada form the most desperate contingent of the West, while California proved slightly better than the national average, with 25.46 bankruptcies per 100,000 individuals. To underscore the problem of bankruptcy in specific states, we selected the 10 with the highest per capita rates and visualized their totals relative to the national average. There’s no mistaking the evidence: While bankruptcy hurts everywhere, its presence is distributed unevenly, with some corners suffering disproportionately. 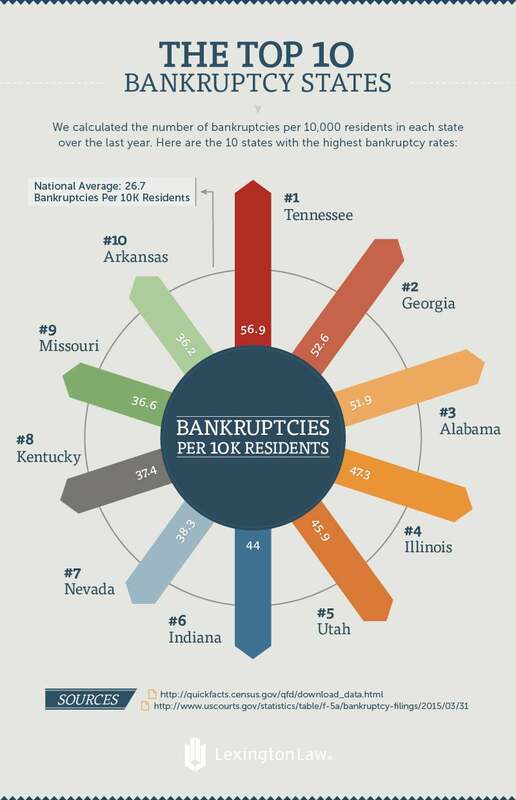 Tennessee’s rate of bankruptcy alone is roughly 118% greater than the national average of 26.7 per 10,000 residents. In the following graph, we see the relationship between incomes and bankruptcy prevalence. In the graphics above, we established that bankruptcy is particularly powerful in places where poverty is commonplace. So we decided to look at the average household income in every county in America to see if bankruptcies were more prevalent in counties with household incomes below the national average. The first striking detail is the relatively small number of counties with household incomes above the average. Obviously, a select minority of counties enjoy average incomes, which are substantially higher than most; as a result, the majority of counties fall well below the average household income nationwide. The next interesting conclusion is that no economic segment of the country seems immune to bankruptcy. Even above the average income marker, bankruptcies appear at per capita rates similar to the average overall. 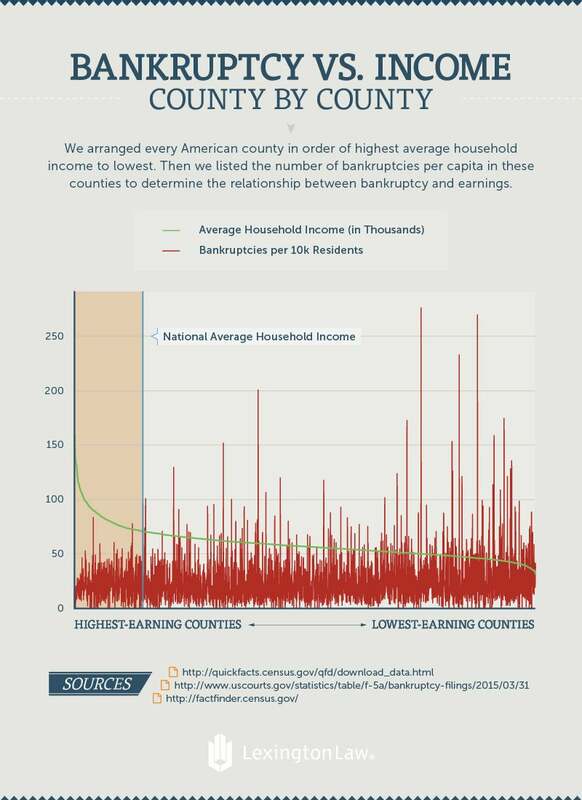 But there is a sharp difference in the counties above the average income mark: There aren’t any outliers with astronomically high numbers of bankruptcies per capita. So while bankruptcy still rears its ugly head in rich communities, poor counties are the ones at risk for total devastation. Whether you’ve witnessed a friend or family member endure bankruptcy, heard it discussed in the news, or even experienced it personally, you now know it touches the lives of thousands every year. How can America prevent this outcome in the future, and what can those who go bankruptcy do to restore their financial standing and contribute to our economy? Those are questions best left to policy makers and activists. Feel free to share the images found on this page freely. While doing so, we ask that you please attribute the authors of this project by providing your readers with a link back to this page. Doing so will allow readers to learn more about the research and methodology behind the project.